Another nuance of activity occurred in Bali on Tuesday, as the parole process for Schapelle Corby inched forward once again. Representatives of an agency of the Indonesian Justice Department visited the house where she would be required to live if she were let out of jail early. Even though she has not yet applied for parole, as with all things Corby, the "news" drove some of the frothier parts of the Australian media into habitual overdrive. Some outlets have even put a date on her release – October 30. Well, that may or may not be so. Like the last time a date was so confidently predicted (in May last year, August 2012 was said to be when she would return to Australia), it’s far enough away to be possible, yet not so close that anyone is held accountable if the date is missed. So, assuming her release is coming up after almost nine years in jail, let’s take the opportunity to assess our attitude to Schapelle Corby. Many people have spent a great deal of time and energy poring over this one woman’s case – the Australian consulate in Bali; authors; lawyers; dozens, if not hundreds of journalists; prison officials, professional internet conspiracy theorists, politicians in both Australia and Indonesia. It’s not only the Australian media who go into a frenzy at the mention of her name. She has become a touchstone in the Indonesian press, too. There, though, it’s not about an innocent entrapped in a third-world system, it’s about the ugly habit of Westerners to aggressively demand special treatment. The head of Bali’s Kerobokan jail, Gusti Ngurah Wiratna, remarked to the press in frustration recently: "I’ve got 1000 prisoners, why are you only interested in Schapelle?" Hundreds of thousands, perhaps millions of dollars, have changed hands – for paid interviews with the family, internet ads, defamation actions and other civil court actions, royalties and lawyers fees. Her 2004 arrest and imprisonment has turned into a Schapelle industry. Sadly, for several years, the subject of that industry has suffered from severe mental health issues, and has largely removed herself from its centre. Even the Corby family-friendly journalists can only quote "those who know and live with her" in their stories because Corby herself refuses any direct interaction with the press. She does not even go to the visitor’s area of Kerobokan in case there might be journalists there. Her absence, for the same reason, from compulsory prison events, has potentially even harmed her cause. For a long time Fairfax Media readers have held the dual belief that Corby is guilty, but that she deserves a shortened sentence. Views of her innocence in the broader public are likely to be higher, but substantially lower than at the height of the "Our Schapelle" frenzy of 2004 and 2005. It’s her perceived innocence that initially drove the Corby story to the point of obsession, but even though this has changed, nine years later, we in the media remain closely focused on every detail of her incarceration and possible release. Perhaps we assume people will be moved by the same impulses, or the echoes of the impulses, that moved them a decade ago. But let’s consider what all this will mean when she is ultimately released, whether on parole or at the end of her sentence. After 10 years in a bubble, Corby will be exposed to the world. She’ll be walking the narrow streets of Kuta, living in a Balinese compound whose address is well known, with the world’s media – including a chaotic Indonesian press pack – on her doorstep. The inevitable paid interviews will create an appetite among the unsuccessful bidders for exclusives of a different kind – for evidence of her poor mental state, for pictures of her drinking her first beer, wearing a bikini at the beach, hanging out with a man, throwing a tantrum. In the open, she’ll lack the protection afforded by the Australian consulate from the tourists and stickybeaks who even now occasionally try to get into the jail to visit her. The local police are unwilling and unequipped to provide any protection. Whatever you think of her guilt or innocence, Corby has served a long sentence, and her adjustment to life on the outside – difficult as it will be already – can only be made immeasurably harder by such attention. Perhaps it’s time to let go of our decade-long obsession and finally just leave Schapelle Corby alone. • With continued remission for good behaviour, she is likely to be out in 2015 even if she does not win parole. TODAY (10th July) is Schapelle’s Birthday. She is 27 again. She is 27 every year, because that is when the corrupt and the criminal in office stopped her life, and started her nightmare. She stopped celebrating her birthdays in 2005, insisting that she would remain 27. She couldn’t face them. She couldn’t face realizing that she was yet another year older, that yet another year had been lost forever, and that another year of turmoil and torture lay in front of her. Her birthday will be like every other day. She will wake up in her overcrowded overbearing squalid cell. She will take her medication to escape the demons, to stop her thinking about her reality… to get through the day… somehow. The day will never end: it will last forever. The thoughts will keep coming back into her mind, and she will chase them out again, topping up with the medicine when she can’t chase them any longer. She will miss her home, her family, her freedom, her life, and will wonder again why this happened to her. She will chase the thoughts away, before she breaks down again. As the medicine wears off, she will again become distressed, and paranoid, looking for cameras which can appear at any time. She will watch the door in case the Australian media appear. She will panic. She will run for the medicine again. Perhaps it is a kindness that she doesn’t know about the callous mocking of her suffering, by the media, and by so many of her own people. Perhaps it is a kindness that she doesn’t know that, even yesterday, the same vile and twisted media presented her as "happy", to placate public opinion. After an absolute eternity, night will eventually come around. She will have survived another day, and she will escape into a fitful tormented sleep. Her 35th birthday will be over. At last, another day will have gone. Schapelle: we will not wish you a happy birthday… instead, we will use the sword of truth to fight harder and harder for you. We will confront the corrupt. We will take your barbaric sacrifice to the world, and we will shout from every rooftop. You will never stand alone. People For Schapelle. Arifin is a former Indonesian Minister, and has recently begun a one man campaign in Jakarta for Schapelle. He has seen the Expendable Project material, and has continued his own research…. research which shows that no Indonesian has ever been sentenced to 20 years, even when carrying thousands of kg of marijuana. He has produced tables to demonstrate this discrimination and racism. These have been sent to the Australian government, who of course already know (Schapelle’s lawyer wrote to them in 2005). Predictably, they have failed to respond. Thank you for caring for Schapelle. bag were meant to be collected in Sydney by him. They suppressed this corroborative evidence, and never told anyone. A few weeks ago, The Expendable Project received information which showed that the AFP had information which corroborated the story of a man who had been ridiculed by the media in 2005, when he confessed that the drugs in Schapelle’s bag were meant to be collected in Sydney by him. They suppressed this corroborative evidence, and never told anyone. Expendable has today produced a report on this: see the story is below. Somehow, though, this is business as usual in Australia. The Expendable Project has proved… not alleged… PROVED… corruption and criminality by the Australian government and the AFP. There is no scope for any doubt, as the government emails and cables amount to a smoking gun confession, again and again and again. But proof of a national scandal of the highest magnitude is not enough. Proof that an innocent has been sacrificed for commercial interests, and to hide AFP corruption, is not enough. The people of Australia are largely ignorant of it. They world is oblivious. Why? Because the media, which in Australia is owned by a tiny handful of rich and powerful vested interests, refuse to report it. They are hiding it from the people. Those damning cables and emails don’t exist as far as they are concerned. And yes, they all know about them. There is one, and only one, way around this…. US. We have to take this to everyone. We have to take it to the world, person by person, day after day. In the coming weeks People For Schapelle will be rolling out a campaign, leading to a ‘Schapelle Week’ and a ‘Schapelle Day’. More information will be posted soon. But in the meantime, please continue to post www.expendable.tv to wherever you can. Send it to your friends, colleagues, media, politicians, anyone…. Facebook, Twitter, emails, forums. Print the posters, write the CDs, talk, anything. Schapelle’s life depends on us all…. let’s fight for her. On Wednesday 4th April, ex-Detective Sergeant Christopher Laycock will appear for sentencing in a Sydney court, for a string of offences. These stem from the Cobalt Report, which was presented by the Police Integrity Commission to Parliament in 2005, and which presents him as one of the most notorious criminals in Australian history. But, what meets the eye will be something of a mirage. His last hearing, on 29th March 2012, was closed to the public, on account of a mysterious 30 page ‘naming and shaming’ document, which his lawyer had dramatically presented at the hearing previous to this. The AAP has subsequently reported what the court instructed them to report. The real story here is not only what is in that document, and why it has taken 8 years for Laycock to meet his fate, but what the New South Wales Crime Commission, and the AFP, have hidden from the public for 7 years. The Laycock gang, including John Robert Dunks, and David John Hopes, engaged almost every crime in the book. One was drug syndication. Indeed, a man called William Miller had named Dunks, on oath, to a court, as the man who had given him the job to pick up a quantity of marijuana from Sydney airport, on 8th October 2004. You will recognize the date, and perhaps the name. Miller had been ridiculed by the media in July 2005, as a money chaser, when he broadly presented this story in the wake of Schapelle Corby’s dysfunctional Bali trial. The NSWCC and AFP? The Expendable Project have just published an extract from the minutes of a confidential NSWCC internal meeting, attended by Mark Standen, amongst others (header attached). This confirms that Dunks was a ‘Person Of Interest’ in 2004, and that the NSWCC had secretly recorded a conversation between him, and Miller. The conversation corroborated Miller’s account of the airport pickup job. The NSWCC recognized the significance of this recording, and consulted a named officer within the AFP with this information. But both parties sat on it. 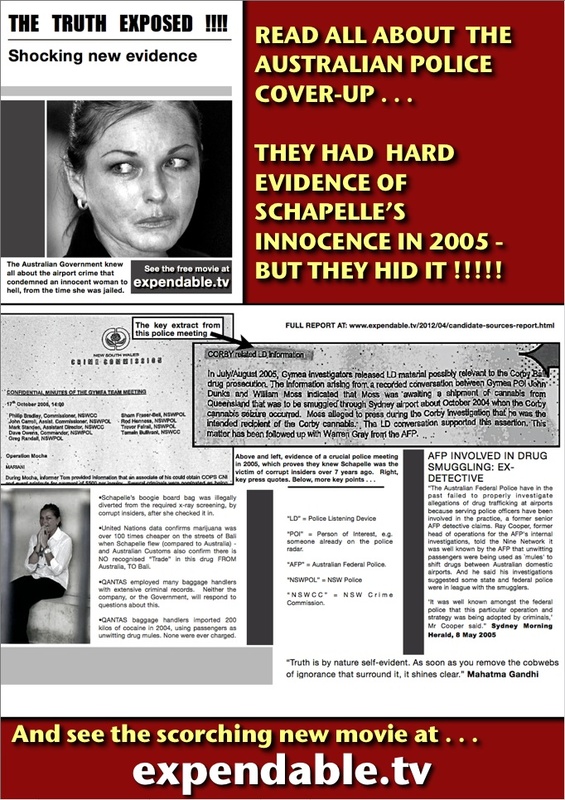 Schapelle Corby was never told. No-one was ever told. No-one would ever have been told, had The Expendable Project not obtained those minutes. The Laycock/Miller affair is documented in Section 2. On Page 2-34 of the PDF you will find the extracts from the NSWCC meeting. The Expendable Project have stated that further information will be published in due course. A few weeks ago, The Expendable Project received information which showed that the AFP had information which corroborated the story of a man who had been ridiculed by the media in 2005, when he confessed that the drugs in Schapelle’s bag were meant to be collected in Sydney by him.